Ok, I've decided to embark someplace else. 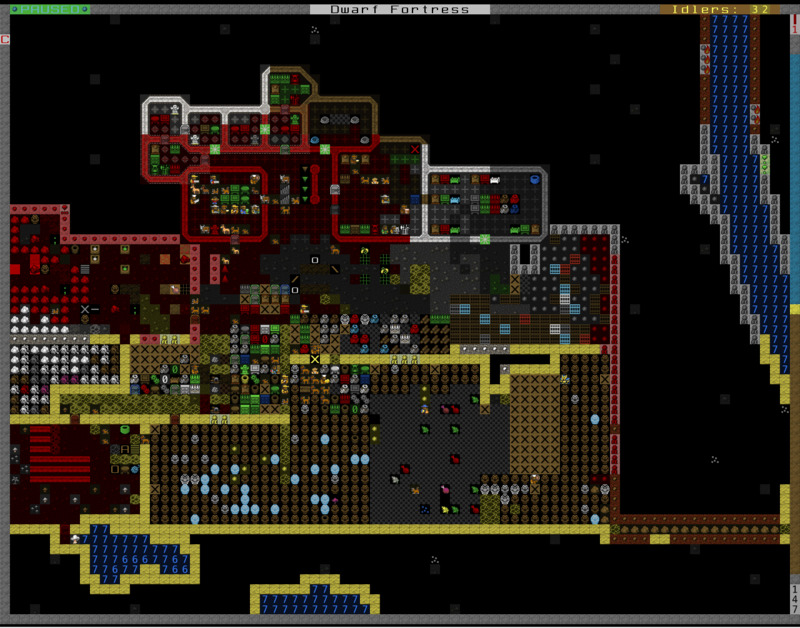 Now why won't my dwarves start digging? Seriously, this is starting to become a huge problem. Sending out the metaphorical Batsignal, help me. Toady wrote: Today saw the addition of an oft-requested feature -- the ability to geld! We stayed away from new parts, but there's a body part tag for it on appropriate male critters, as well as a job and so on. The job takes place at the farmer's workshop after the animal is designated in a way similar to slaughtering. The process is modeled with a wound within the existing framework. REALLY big news. That means dwarves don't have spores anymore - they slime instead! Does anyone have a list of nice mods? You'd have to give us an idea of what you like, first. Talvieno wrote: You'd have to give us an idea of what you like, first. I'm just panning around randomly at the moment. Well, there are full conversion mods, mods that add extra creatures or items, and mods that are designed to make your gameplay experience more fun or more realistic. If you're looking for a full conversion, you might try Putnam's Fallout mod, perhaps. I think Deon's Genesis mod is pretty good, too, but I can't remember if it's for Adventure or Fortress Mode. If you're looking for an extreme challenge, you might try Fortress Defense, but make sure you batten down the hatches. If you're wanting a single new creature type, your best bet is to either mod it in yourself, get someone else to make it for you (I'd do that, just ask), or download a larger mod and take single creatures from it. I have one creature in particular that I've spent a lot of time on called a Scythod... I should probably re-upload it. Keep in mind that more in-depth texture packs like Phoebus make your savegames unlikely to work well if you send them to someone else, especially if you've custom-modded the game. If you're looking for a regular tileset, those are easy to come by, too. There are also utilities... I have one that made random procedural creatures, but I still need to update it to the next version. I also have another that makes "radiation zones" that do bizarre things to your dwarves, which you might potentially find interesting as well, as long as you don't mind blood, vomit, pus and miasma all over the place. why does a texture pack compromise your savegame compability? shouldnt they work removed from the actual game logic? They modify the raws symbols used by different creatures/stone types/grass types, so your save game looks really weird when you load it back into ASCII DF (or another texture pack). It's fixable if you replace the raws before you package it for someone else, but in a few select cases it's just about impossible, like when you have a large number of mods implemented, or a lot of minor custom changes to keep track of. The game logic pulls an ASCII character from the raws (database file), retrieves the correct image from a texture pack, sends it through the graphics engine and displays it on the screen. Tilesets assign images to ASCII characters. Texture packs do the same thing, with the exception of being able to assign many, many more images - your carpenters and masons will look different rather than just be a different color, for instance. They do this by changing many of the ASCII characters defined in the raws to make the texture pack work/look even better. There's also a special section in the raws just for the purpose of texture packs, and while that section is virtually empty in vanilla DF, texture packs store a lot of data there. Removing the texture pack without re-converting the raws makes things look weird. It's no issue if you don't plan to, though. Talvieno wrote: . If you're looking for an extreme challenge, you might try Fortress Defense, but make sure you batten down the hatches. Sounds fun. I'll check it out when I'm not on mobile. many of those things are far away from being ascii characters. a dwarf should always have the same symbol in the ascii storage, and from that ascii storage should a texture get chosen, and not the other way around like you describe it. like you describe it the texture packs actually change the letters on the cubes to change the allocation letter <-> sticker. like replacing all "D" with "X" and giving the graphics engine a box with improved dwarf stickers and tells it "put those stickers on X"
instead of taking the old "D" box and putting a new box with better stickers there.